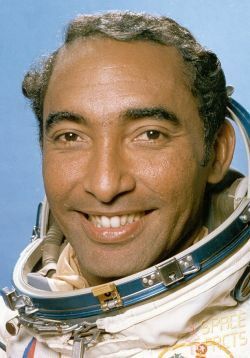 Brigadier General Arnaldo Tamayo Méndez, a Cuban of African descent, was the first black astronaut in space. Tamayo Méndez was born in Guantánamo, Cuba on January 29, 1942. Orphaned at the age of one year, he was ultimately adopted by foster parents Rafael Tamaya and Esperanza Méndez. He began working at the age of 13, shining shoes and vending vegetables. He later became a carpenter’s apprentice. During the Cuban Revolution in the late 1950s, he joined the Association of Young Rebels, which had protested against the Batista regime. He also joined the Revolutionary Work Youth Brigades. Tamayo Méndez attended the Rebeldi Technical Institute where he took a course for aviation technicians in December 1960. After training as an aviation technician, he resolved to become a pilot. From April 1961 to May 1962, he took a one-year course of study at Yeisk Higher Air Force School in the Soviet Union, where he trained to fly the MiG-15 fighter jet. Returning to Cuba in 1962, Tamayo Méndez joined the Playa Girón Brigade of the Cuban Revolutionary Guard and flew twenty reconnaissance missions during the Cuban Missile Crisis. In 1967, he became a member of the Communist Party of Cuba and for the next two years served with the Cuban Revolutionary Armed Forces in Vietnam. From 1969 to 1971, he studied at Maximo Gomez Basic College of the Revolutionary Armed Forces. And, in 1975, Tamayo Méndez became chief of staff to the Aviation Brigade of Santa Clara. The following year he was promoted to the position of Lieutenant Colonel. In 1978, after a rigorous selection process, Tamayo Méndez was chosen to become the seventh cosmonaut of the Intercosmos program. This program had been developed to fly non-Soviet cosmonauts on the Soviet-owned Soyuz and Salyut spacecraft. Thus he came to “Star Town,” the Zvezdny Gorodok Soviet Space Center, in April 1978, spending two and a half years there training for space flight. Tamayo Méndez and Soviet cosmonaut Yuri Romanenko flew together aboard Soyuz 38, departing September 18, 1980. They docked with the Salyut 6 space station. From Salyut 6, the two men and other crew members carried out 27 Soviet-Cuban joint experiments, mainly developed by Cuban scientists. The mission lasted seven days, 20 hours and 43 minutes. This space sojourn had social, political, and economic value beyond the gained scientific knowledge; both Soviet President Leonid I. Brezhnev and Cuban President Fidel Castro endorsed the joint mission to strengthen the bond between their nations. Tamayo Méndez and Romanenko were both granted upon their return the following awards: the title of Hero of the Soviet Union; the Order of Lenin; the title of the Hero of the Republic of Cuba, with Gold Star Medal; and the Order of Playa Girón. During 1981-1992, Tamayo Méndez directed both the Society of Military and Patriotic Education (SEPMI) and the Aviation Club of Cuba. During that time he was promoted to Brigadier General in the Cuban air force. He has also served as Chief of the Department of Foreign Affairs for the Cuban armed forces (MINFAIR) and as the director of Cuba’s civil defense organization. Since 1980 Tamayo Méndez has been a member of the National Assembly of People’s Power, the elected Cuban national legislature, representing his home municipality of Baracoa. Arnaldo Tamayo Méndez married Maria Lobaina in December 1967. The couple have two sons, Orlando and Arnaldo. "Arnaldo Tamayo Méndez," Encyclopedia Britannica Online, URL: http://www.britannica.com/EBchecked/topic/1509108/Arnaldo-Tamayo-Méndez.